How the Beach Changed Our Lives. Something incredible happened to these readers when they headed on to the sand. Could I really learn to surf ? Sitting on a lonely stretch of beach I gazed out to sea and asked myself where it had all gone wrong ? I was 45, living in a coastal village near Biarritz, France, and my marriage had ended. Nick and I had three gorgeous children and had tried so hard to make it work, even moving out here to France from our home in Ireland. But everything just unravelled and I was so scared – Alice, my youngest, was only five. It was met with puzzled looks. It was chiefly a male sport in France and certainly not for middle-aged women with kids. But I was serious. I swapped one of my paintings for a surf board and another for lessons with an instructor. And I made friends with Johanna, who had just moved to the village and wanted to try surfing too. This was the answer – learning with others.Getting slapped by a wave on your own was embarrassing. In a group it would be funny. And so the Mamas Surf Club was born. The idea was that it would be for forty-something women. 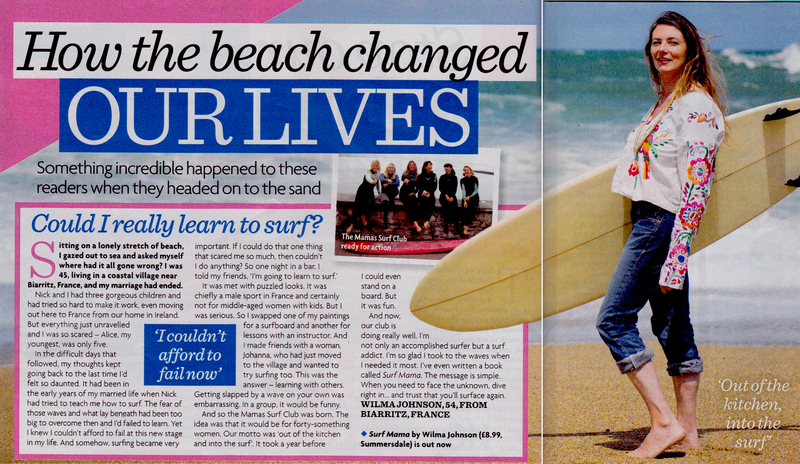 Our motto was ‘out of the kitchen and into the surf.’ It took a year before I could even stand on a board. But it was fun. And now our club is doing really well. I’m not only an accomplished surfer but a surf addict. I’m so glad I took to the waves when I needed it most. I’ve even written a book called Surf Mama. The message is simple. When you need to face the unknown, dive right in ….. and trust that you’ll surface again.